Tiger Tales: A Detroit Tigers Blog: NO HITTER FOR VERLANDER ! Justin Verlander is almost always good. Usually very good. He has been arguably the most consistent pitcher on the team over the past two years. He has the best stuff on the staff. He pitches more like a poised veteran than a 24 year old Sophomore. However, he rarely pitches a dominant game. His career high in strikeouts coming into tonight was 8 and he gives up a lot of fly balls. He often remarks that "I didn't have my best stuff tonight" or "I didn't have all my pitches". Tonight, it was clear from the start that he had everything working - a fastball reaching 100 MPH, a nasty curve, an excellent change-up. In the first inning, when he struck out Craig Counsell and Tony Graffanino, you could sense this was going to be big night for Verlander. He had one more strikeout in the 2nd and another in the 3rd. He did allow his first base runner, a walk to Billy Hall, in the 3rd. Brandon Inge's solo homer in the bottom of the third gave Verlander the only run he would need. Justin struck out the side around a walk in the 4th. He now had 7 strikeouts through 4. He added another strikeout in the 5th to tie his career high. he allowed his third walk of the game in that inning but still no hits. It's at that time, I was realized he had a chance for a no hitter. Verlander retired the Brewers in order in the 6th and also recorded his 6th strikeout. The Tigers gave him some breathing room with 2 runs in the bottom of the inning thanks, in part, to Curtis Granderson's 13th triple of the year. Now ahead 3-0, the 24 year old right-hander got the Brewers 1-2-3 again in the 7th but this time he needed some help. Magglio Ordonez made a sliding catch of a sinking liner off the bat of Corey Hart to preserve Verlander's gem. The inning ended with his 1oth strikeout. With a 4-0 lead in the 8th, he allowed a one out walk to Billy Hall, the third walk of the game given to the Brewers center fielder. The next batter Gabe Gross then hit a shot past Verlander towards the middle and the hearts of Tiger fans skipped a beat. However, shortstop Neifi Perez, subbing for Carlos Guillen, made an excellent stop and then flipped it to Polanco to begin an inning ending 6-4-3 double pay. The crowd in Comerica Park was on it's feet on every pitch in the 9th. 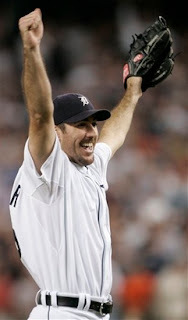 Verlander started out the 9th the same way he began the game. He struck out Counsell for his 11th of the game. He followed that up with a strikeout of Graffanino, the 4th time he had punched out the Brewers second baseman on the night. It was down to one more out and up came the dangerous JJ Hardy. Verlander got two quick strikes on him but then he fouled off a couple of pitches to stay alive. Finally, he hit a routine (although it didn't seem that way at the time) fly ball to Ordonez in right and the no hitter was complete. It was the first no hitter for the Tigers since Jack Morris in 1984 and the first no hitter at home since Virgil Trucks in 1952. The best part about this no hitter was not so much that it was a no hitter. It was the fact that he did it so easily - 12 strikeouts, 10 ground outs, just 3 balls out of the infield, an easy ninth inning. This was not one of those flukey no hitters that happen once in a while. Just the other day, a poster on Motown Sports was asking why I didn't think that Verlander had been dominant in his career so far. He asked me to define "dominant". I wrote one of my essays on fielding independent pitching and pitch counts. I'm not sure whether anyone bothers to read that stuff though. So, I'll use the word in a sentence. Tonight, Justin Verlander was DOMINANT. It had the most birds in and around the playing surface of any no-hitter ever thrown, including all no-hitters thrown in wiffleball games on tuna boats.